But only a Root Chalice changes the shape of the Chalice Dungeon when used in a ritual. There are trace remains of medical procedures in parts of ailing Loran. Whether these were attempts to control the scourge of the outbreak, is unknown." 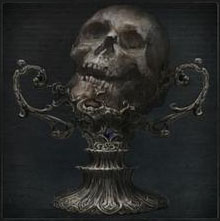 Lower Loran Chalice is a Chalice Item in Bloodborne. You can create this chalice dungeon by combining the materials listed below at one of the Tomb Altars in Hunter's Dream. This dungeon never changes Bosses, design or loot. In the pre-area of the layer 3 dungeon, there will be a bath messenger, sitting in the middle of a room, from which you can purchase the Sinister Lower Loran Root Chalice for 18,000 blood echoes. The messenger also sells Lost and Uncanny versions weapons from The Old Hunters DLC. The pre-area directly connects to the main area through a one-way door. Blood-Starved Beast can occasionally appear as mobs if Fetid, Rotted and Cursed Offering were used together. I&apos;m lvl ~200 and Loran Darkbeast is still so freaking annoying, especially when he goes nuts with <50% of his health. This game is freaking awesome, 2 years later and now i&apos;m trying to get the weapons trophy. Would love to co-op and beat this f****r!! Holly molly, ppl going to lower loran depth 5 at bl 50, and i almost lost my mind at defiled chalice depth 4 bl 120. How the **** they do that? edited depth to 5, it&apos;s not 4. I got 2 different Lower Loran Chalice items, 1 is Depth 5 and the other is Depth 4. I couldn&apos;t find an established multiplayer dungeon for this chalice. If anyone has kne for Fextra or otherwise, that would rock! If nothing else, feel free to join mine: u86kbasu. I could certainly use some help as of this posting. MorteMcAdaver, level 112. Need help against the abhorrent beast. Glyph: g9n572k8 psn: xV1de. Well, misposted at first but here goes again.. The Abhorrent Beast does not drop the Lower Loran Chalice for me. Defeated him twice, in Ailing Loran and Ailing Loran Root. Any idea on how to progress? Is it supposed to be a guaranteed drop? In Layer 2, immediately run to the right, go up the ladder, make your way outside to the first long bridge, immediately fall down to the bridge below and head back toward the way you came but you&apos;ll end up in a treasure room. treasure with 1 red jelly is immediately to the left hand wall, run to it (the beast will not be alarmed yet), grab the 1 red jelly and warp out. from there you can buy them for 5 insight. Hello, need help for Loran Dark Beast (Lower Loran Chalice chalice, layer 3) : Creator : Sellyon ; glyph : 5uwz5e8b . I am lvl 147. Anyone can help ? It said I did not match the requirement to join? What requirement is there? Could I get some help on the bosses for this chalice? I want to farm Bloodstone Chunks but can&apos;t figure out how to get the Sinister Lower Loran Chalice.